They found those who were exposed to the most screen time at the age of two showed poorer development by the age of three. The researchers, whose findings are published in the JAMA Pediatrics medical journal, tracked 2,400 children for their study. They found that on average, the Canadian children viewed screens for 2.4 hours a day at the age of two and 3.6 a day at the age of three. At the age of five, when they had started school, they still were spending 1.6 hours using gadgets or watching TV every day. The figures, which are similar to statistics seen in British studies, suggest that children are spending so much time in front of screens that they are missing out on crucial developmental activities elsewhere. The scientists wrote: ‘Child development unfolds rapidly in the first five years of life. ‘The present study examined developmental outcomes during a critical period of growth and maturation, revealing that screen time can impinge on children’s ability to develop optimally. ‘When young children are observing screens, they may be missing important opportunities to practice and master interpersonal, motor, and communication skills. ‘For example, when children are observing screens without an interactive or physical component, they are more sedentary and, therefore, not practicing gross motor skills, such as walking and running, which in turn may delay development in this area. Some experts say toddlers should not be given smartphones and tablets to play with until the age of two - and then they should have their daily screentime limited to no more than an hour a day until they are at least five. Dr Aric Sigman, a psychologist and lecturer in child health education in Brighton, warned in a 2017 study that staring at gadgets early in childhood can lead to ‘screen dependency disorder’ - an addiction to electronic devices that may last a lifetime. He says parents should follow the guidance set down by the Australian Government, which says babies and toddlers until the age of two should be exposed to no television or gadget screentime at all, and children aged two to five should only have access for one hour a day. Over fives should spend no more than two hours a day in front of a screen, it says. The US Government has similar guidance. 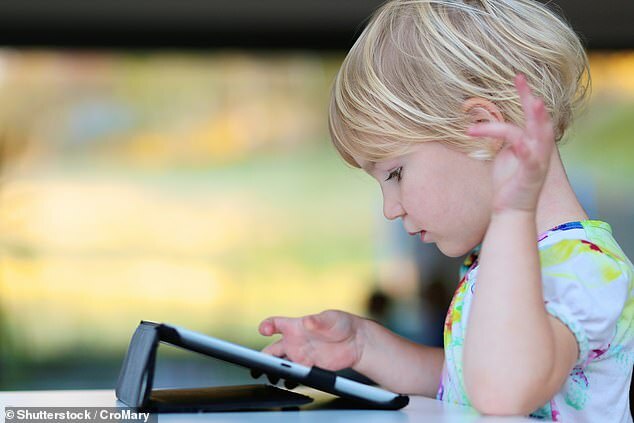 Britain does not have guidelines on the issue, although Dame Sally Davies, the UK chief medical officer, has urged parents to set their own ‘age-specific maximum times’ on screen use to reduce potential damage. Dr Ben Carter, a scientist at King’s College London, advises that all people - adults included - should put their phones down an hour and a half before bed time. He has found in his own research that children and teenagers who use an electronic device within 90 minutes of going to bed are twice as likely to get insufficient sleep - and are nearly three times as likely to feel sleepy during the day. DOES WATCHING TELEVISION INCREASE CHILDREN'S RISK OF DEVELOPING DIABETES? Watching television for three or more hours a day may increase a child's risk of developing type 2 diabetes, research suggested in July 2017. Children who spend at least three hours in front of a screen are heavier and have greater insulin resistance, a study found. Both of these are risk factors for the condition. Such youngsters also produce impaired amounts of the hormone leptin, the research adds. Leptin is involved in regulating appetite. These results remained even after the study's participant's activity levels were taken into account, the study found. Study author Dr Claire Nightingale from St George's, University of London, said: 'Our findings suggest that reducing screen time may be beneficial in reducing type 2 diabetes risk factors, in both boys and girls, from an early age. The researchers analysed 4,495 children aged between nine and 10 years old. The children were assessed for factors that influence their risk of developing diabetes. Their body proportions, activity levels and the amount of time they spend in front of a screen - either watching television or using a computer - every day were also recorded.